Cantilever racks are the best way to store long, heavy loads. Whether the load is a single item or a bundle of them (like lumber, tubing, or pipes), as long as you understand the load, these racks are ideal storage. One key to correctly loading and specifying them is nailing the necessary lateral spacing vs. load weight so that you have enough arms beneath the load. Lateral spacing is the distance between cantilever arms. If you don’t have enough space to hold your load and prevent it from sagging, you need more arms. If you don’t have enough arms, the rated capacity of each arm is diminished. The load needs to overhang the end arms by half the distance from the center of one upright to the center of the next. You can test your load by laying down wood blocks on the floor, and then placing your load on them. If you see deflection for two blocks, you need to add another (and so on). You can always contact us to help you determine if your load requires additional assistance. 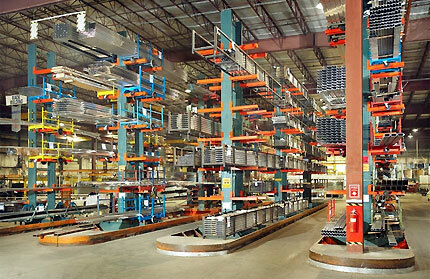 See Cisco-Eagle’s guide to cantilever rack configuration for more assistance. You can also submit a cantilever rack inquiry.